Bordeaux is France’s largest fine wine region in both production and vineyard acreage, with over 7000 producers and 60 Bordeaux appellations recognized by the AOC (the Appellation d’Origine Controlle). Saint-Émilion, both a town and appellation in the Bordeaux, has a history that dates back to Roman times and is the oldest still active wine producing appellation in the Bordeaux region. Naturally, I was disappointed to see that wine tasting in Saint-Émilion wasn’t part of my Viking River Chateaux, Rivers & Wine itinerary. Thanks to the powers of social media, a reader connected me with her friends who are wine makers and owners of Château Cantenac in Saint-Émilion. My Viking River ship was docked in Libourne and Chateau Cantenac is well located on the main road between Libourne and Saint-Émilion, so AJ kindly picked me up for a visit to her family’s winery. I already knew from our Facebook messages that AJ, an American from California who studied wine making, had gone to Saint-Émilion to do her internship at Château Cantenac. It was there that she met and fell in love with her husband, the youngest son in the family business. On the short drive from the ship, she told me a little more about the history of their winery. Château Cantenac is actually owned by AJ’s mother-in-law, Nicole Roskam-Brunot. Though the winery dates back to 1870, it was in 1937 that the family acquired it. Visiting Château Cantenac with AJ was a real treat. With her in-depth knowledge of wine making, I learned more than I had on all my winery visits in the last few years combined. Though it was a misty morning, which is very typical for Saint-Émilion and excellent for the grapes, we had a wander around the vineyards. 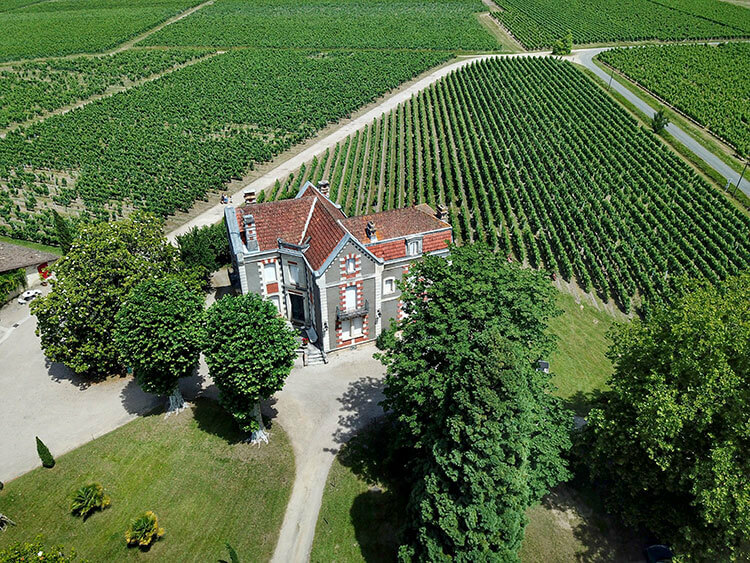 Now 15 hectares, Château Cantenac started with around just four hectares of vines. 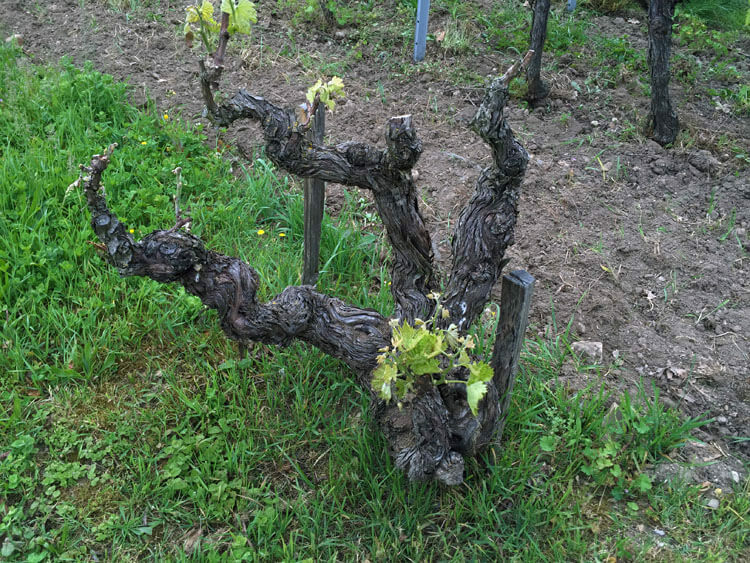 The average age of the vines used for production of Château Cantenac‘s Grand Cru are 35 and their oldest vine is 65 years. The expansion is important because even though older vines mean a higher quality production, as they age they also produce less yield. AJ shows me the various types of tanks that they have at Château Cantenac. I’m no stranger to steel tanks, but I’ve not seen concrete tanks before. She explains that each type of tank has their own pro and cons. They utilize the concrete tanks during the fermentation process and the steel tanks for storing wine to top up the barrels during the aging process. 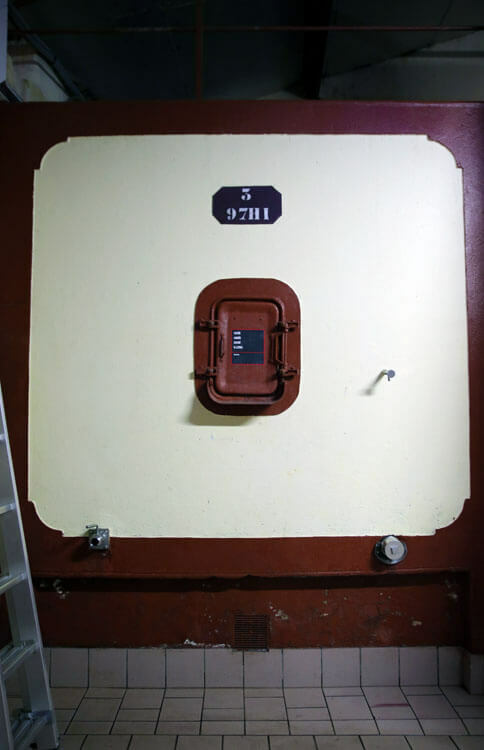 The concrete tanks essentially never have to be replaced, though someone has to hop inside and manually shovel out the skins and seeds after the first fermentation. See how small that door is on the tank? I bet you can guess who gets that job. One of my favorite parts of a winery tour is the barrel room. AJ hasn’t even unlocked the door to the cellar yet and I can already smell the wonderful aromas. There’s just something about French oak and aging wine! 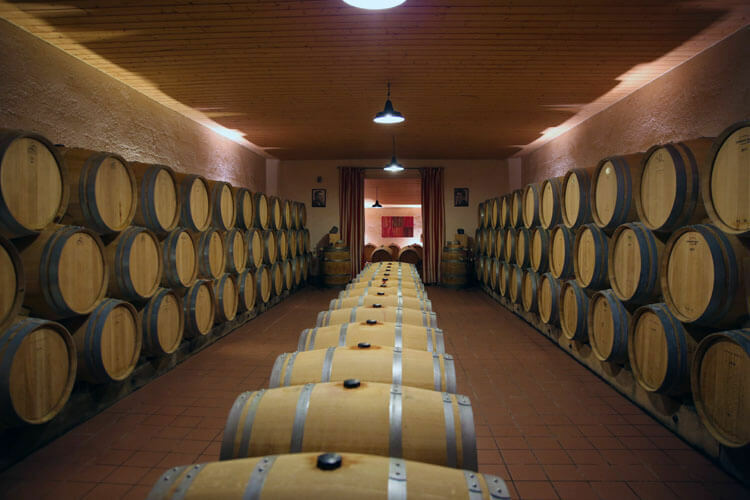 At Château Cantenac, the wine is aged in barrels for 12 – 18 months. And even this is a laborious manual process. The barrels have to be topped off from the “angel’s share,” or very nice way of saying evaporation. The sediment also has to be cleaned out of the barrels and the wine must be emptied out in order to do that. After aging, several blends are made and the family gets together to blind taste test and decide the best blend for the vintage. I’m surprised to learn that no wineries in Saint-Émilion have their own on-site bottling facilities. All the chateaux work out a bottling schedule and a mobile bottling facility makes the rounds to each chateau for the bottling process. I’m in luck and Château Cantenac is bottling during my visit. AJ pauses near the bottling truck to ask her husband if he’s set aside Imperial bottles, which are special six liter bottles. They’re bottling the 2013 vintage, the birth year of their eldest daughter, and it’s family tradition to produce some Imperial bottles of the vintage of each child’s birth year. They’ll open the bottles and enjoy them all together many years from now. The barrel room is a tease of what’s the come, and finally I get my opportunity to taste Château Cantenac’s vintages. We try the 2010 Château Cantenac Grand Cru, which is 75% Merlot, 20% Cabernet Franc and 5% Cabernet Sauvignon. 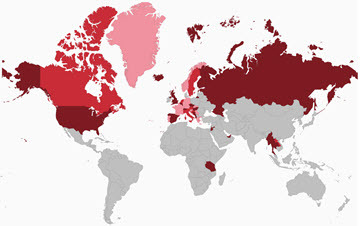 The percentages are representative of the percentages of grape varieties planted in their vineyards. 2010 was a really good year and produced an exceptional vintage. I couldn’t resist buying a bottle to bring home and it will be fantastic for drinking in three years. Château Cantenac also has a label Selection Madame 2011, which is Nicole’s own label. It is 95% Merlot and 5% Cabernet, the grapes were picked in 2011 and the wine was bottled in 2013. It’s great for drinking now. Since my ship was sailing while passengers were out on excursions, AJ drove me to Saint-Émilion to meet back up with my assigned group for the day. She was even kind enough to show me a bit of Saint-Émilion, including where she got marries, and to join me for lunch. L’Envers du Decor in the heart of Saint-Émilion is a a favorite of AJ and her husband. We enjoyed Château Cantenac Grand Cru over a lunch of foie gras and steak. I had a seriously fantastic day thanks to AJ’s hospitality! And while she doesn’t usually just pick people up, visits are possible even if you’re visiting Libourne and Saint-Émilion on a river cruise by booking an appointment and taking a taxi. If you’re in the Bordeaux region, definitely don’t miss a visit to Château Cantenac. Tours and tastings at Château Cantenac are available by appointment in English, French, Spanish and Cantonese. 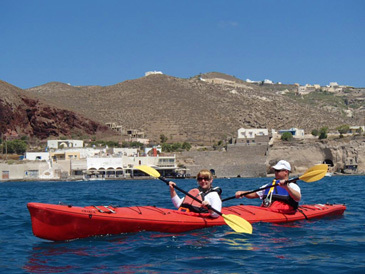 Visits last about 1 hour and are €6 per person for 2 tastings or €9 per person for 3 tastings. Email [email protected] to make an appointment. The Wine Shop is open Monday – Friday from 9am- 12pm and 2pm – 6pm. What a fantastic visit! I am fascinated by the concrete tanks. I have seen more and more of these in California. The fact that this one dates back to 1870, makes me want to do further research on this style fermentation tank! And I would love to hear more about your Viking River Cruise! I have always thought that this would be the perfect way to see wine country, without having to drive and change hotels. There’s lots of ways to explore Bordeaux’s chateaux without needing to drive, but I must admit that having a moving hotel room for 7 nights was pretty nice. That cruise also had a lot to do with why I ended up moving to Bordeaux a year later. Of all the regions, this is my husband’s favourite and he hasn’t been yet. Thank you for the perfect inspiration to start planning a trip there sooner rather than later! Cheers! Oh, you must come visit Bordeaux! This wine region is like no other I’ve ever been to and more than a year on living here, I still have so many chateaux to discover yet.